Passed this 1952 Ford Customline Tudor a while back driving home from Erie, Pa. and yes, it’s the same age as I am (but in much better shape). 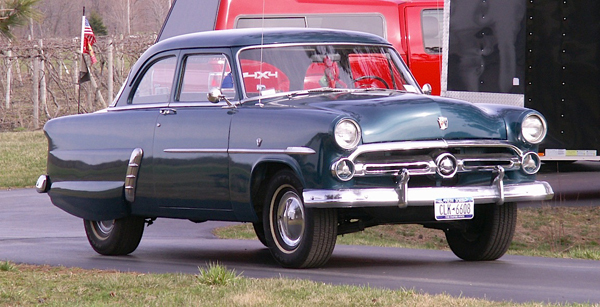 The Customline was positioned between Ford’s low-cost Mainline and higher-end Crestline models. I’m still trying to decide if this one is green or blue; I have however, decided that I really like the custom bladed wheel covers but could probably do without the fender skirts. Thinking back on that day, I believe I was somewhere near Irving when I snapped this photo. Jim Corbran, RRofWNY Check out our new Facebook page: LuvTheCheapies The post RealRides of WNY appeared first on Buffalo Cars.